NOTE: Chameleon helpers also work with Chimera bootloader, which is tonymacx86's version of Chameleon. Chimera is essentially the same thing as Chameleon. We've mentioned Chameleon Preference Pane before, but its name is already self-explanatory: it's a preference pane for Chameleon, which you can add to the Mac OS X System Preferences app. Chameleon Prefpane is an official project by the Voodoo Dev Team, the developer of Chameleon bootloader. Compared to its two competitors, Champlist and Chameleon Wizard, Chameleon Prefpane is probably the weakest app out of the three. Simply put, Chameleon Prefpane doesn't do much. It can edit the boot options of Chameleon bootloader, and that's about it. It's not particularly easy to use, either; the boot options are randomly spread over several pages in the preference pane, so you can never be sure where you'll find a specific option. 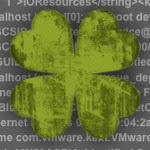 Champlist is standalone app for managing Chameleon bootloader. It's definitely the best-looking app on this list: the developers have clearly given the user interface first priority. When you first open Champlist, it presents a thin gray bar with a set of tabs for updating Chameleon, configuring Chameleon's settings, editing your SMBios, installing kexts, and switching bootscreen themes. Champlist has a quick-update feature for Chameleon under the "Chameleon" pane, if you like to keep up with updates. Its "Configuration" pane, where you can change boot options for Chameleon, doesn't seem to omit any major features. The only big thing that's missing is EFI string injection, a feature that both Chameleon Preference Pane and Chameleon Wizard offer. Another small omission is the "Rename Partition" feature (which we've previously covered), but very few people know about this feature anyways. The most important part of Champlist is the SMBios generator. 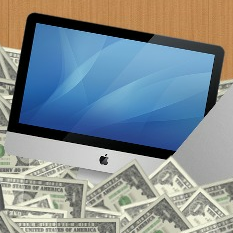 SMBios.plist is a preference file that tells Mac OS X that your Hackintosh is a real Mac. You usually don't need to edit the SMBios to make Mac OS X work, but sometimes, doing so will activate certain features (i.e. the integrated HD 3000 graphics on Intel's Sandy Bridge processors). 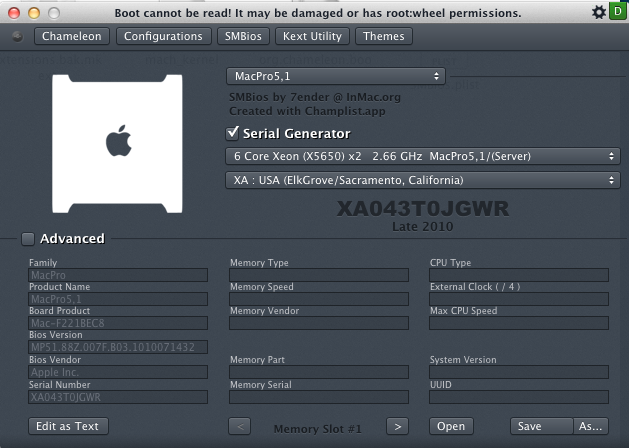 Additionally, generating a random serial number for your Hackintosh can fix certain glitches. Champlist is best known for its SMBios generator, and rightfully so: the user interface is slick and silky smooth. Just choose the proper options from the dropdown menus, click the "Save" button, and your Hackintosh will have a new SMBios.plist. 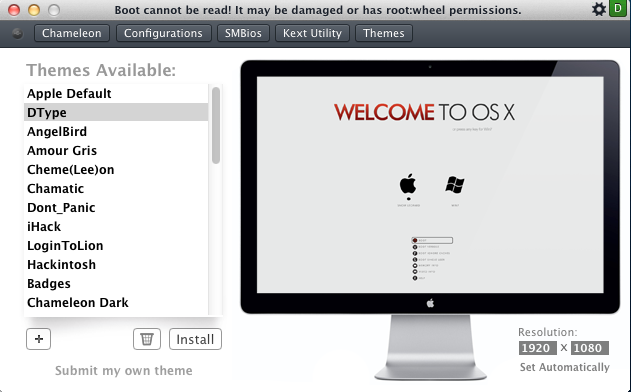 Champlist also includes a kext utility for installing kext files on your Hackintosh. You can already do this with KextBeast (and Multibeast, sort of), but it's certainly not a bad addition. Finally, Champlist has a graphical theme switcher, which allows you to pick and Choose between bootloader themes for your Chameleon bootscreen. You can even download and install new themes straight from Champlist, which is a godsend. There's a preview on the right side of the screen that shows you what the themes will look like. However, when you're browsing themes available for download, the process is really slow, taking up to 5 seconds per theme to load the preview. This isn't a big deal if you know what you're looking for, but if you're just browsing around, this can be really annoying. So keep that in mind. 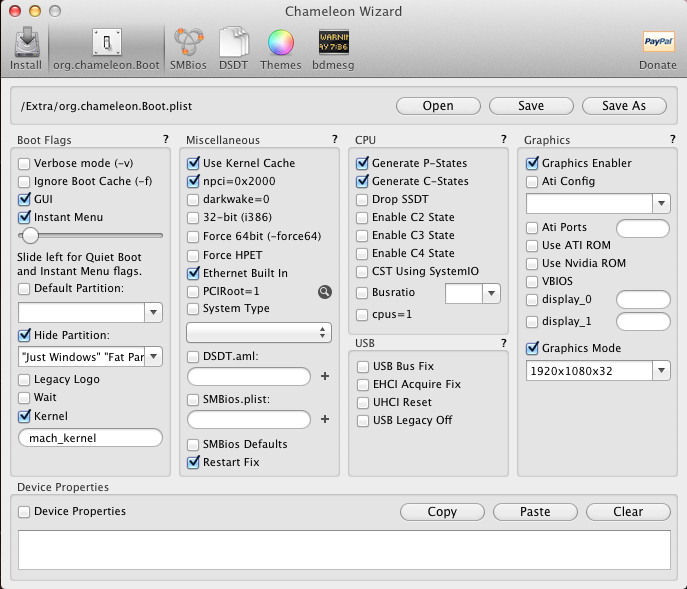 Like Champlist, Chameleon Wizard is a standalone app for managing Chameleon bootloader. In terms of features, Chameleon Wizard beats Champlist by a thin (but noticeable) margin, and it totally mops the floor against Chameleon Preference Pane. 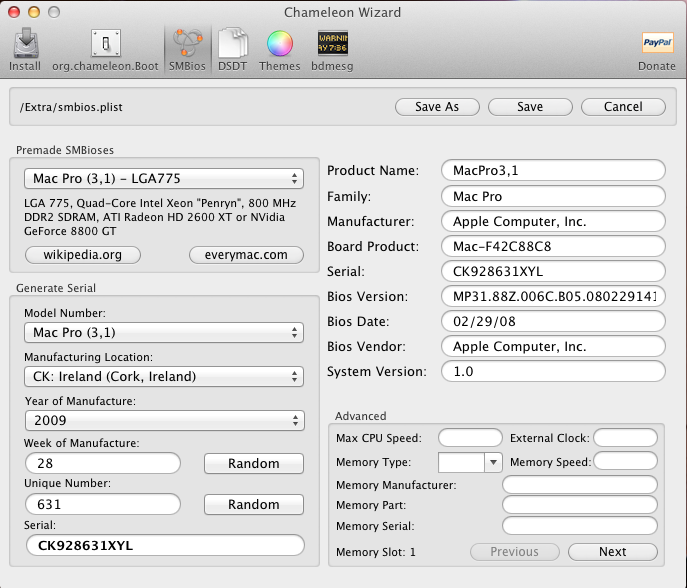 Chameleon Wizard's interface has the standard gray Mac theme, so it doesn't look quite as good as Champlist. However, Chameleon Wizard really shines feature-wise. Most of the aspects of Chameleon Wizard are pretty ordinary: for starters, it has a Chameleon updater, which does exactly what it's supposed to do. 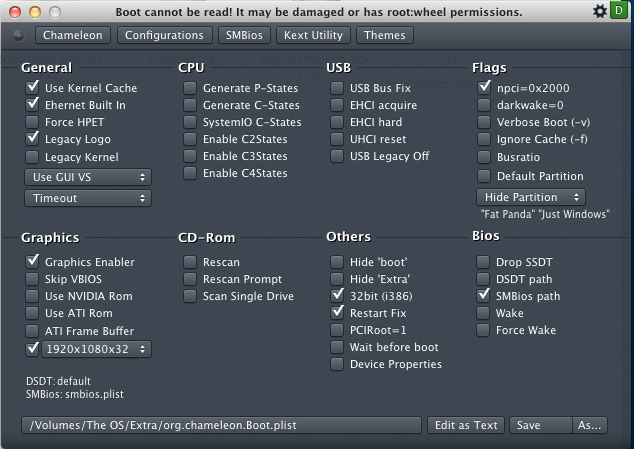 It's got a configuration pane for Chameleon that has all the standard Chameleon boot options, including the ability to inject EFI strings (located under "Device Properties"). 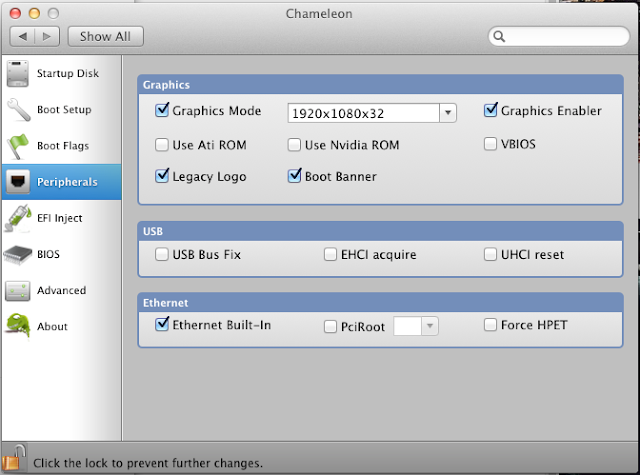 EFI injection is really the only difference between the configuration pages of Chameleon Wizard and Champlist. Like Champlist, Chameleon Wizard can't rename partitions on your bootscreen, either. Under the SMBios tab, Chameleon Wizard has a pretty full-featured SMBios generator, like Champlist. The interface isn't half-bad, and in some aspects, it's actually easier to use than Champlist's own generator, since it automatically fills out your computer's specifications. Champlist forces you to choose all the specifications yourself. Finally, Chameleon Wizard has a graphical theme switcher that's pretty much identical in function to Champlist's own theme switcher. Like Champlist, the theme manager on Chameleon Wizard is also pretty slow. 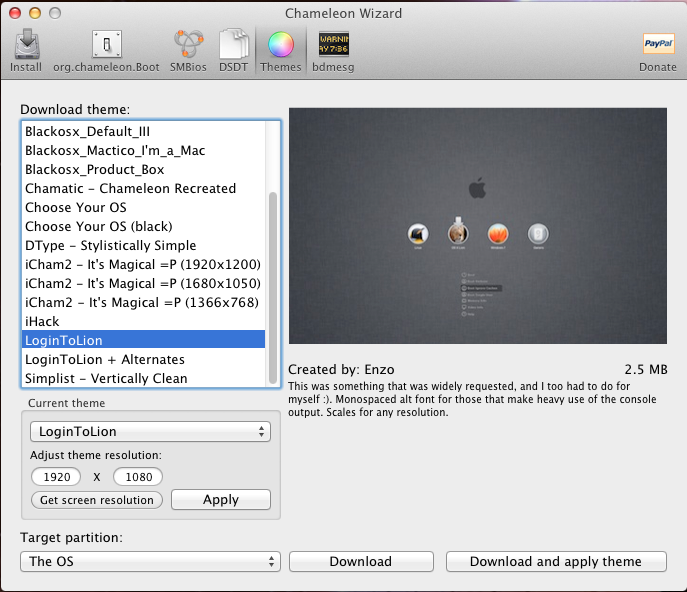 Chameleon Wizard doesn't have quite as many themes as Champlist (though both include my favorite Chameleon theme, LoginToLion). Of the three Chameleon helpers reviewed in this post, Champlist is probably the best choice, if only for its great user interface. Otherwise, it's a pretty close match between Chameleon Wizard and Champlist. Both apps do almost the exact same thing; the only reason I would choose Chameleon Wizard over Champlist is if I needed to create my own DSDT file, since Chameleon Wizard includes a DSDT patcher (which I didn't cover in this review). However, most people don't need to patch their own DSDT file, so it's really not much of an advantage. Chameleon Preference Pane is barely even worth a mention. It was the only helper out of the three that included Chameleon's "Rename Partition" feature, but that's the only good thing I can say about it. All of the options in Chameleon Prefpane are spread out randomly over 5-6 separate settings pages, so it's not winning any awards for its user interface. If you just want small preference pane for occasional use, Chameleon Preference Pane might be worth a look. Otherwise, stick with Chameleon Wizard or Champlist. Of course, everything done by these Chameleon helpers can be done by yourself. If you don't have a problem with setting boot options yourself, or installing themes yourself, then these apps are unnecessary. Even features like the DSDT Patcher in Chameleon wizard and kext utility in Champlist are just ripoffs of standalone apps. 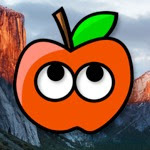 So remember, you don't have to use Chameleon Preference Pane, Chameleon Wizard, or Champlist to set up a successful Hackintosh build.